Coach Pete Cowen and caddie Billy Foster are there and so is big John Newton, the ever-present physical trainer and former bodyguard, whose skills as a fitness man are just as important to Clarke as his unstinting good humour and loyalty. Close now to dropping outside the top 200 in the world, Clarke doesn’t want to bear his soul again and talk about his “Year from Hell” and how he has struggled to cope on and off the course since the premature and tragic death of his wife Heather. But like the elephant in the corner, it’s a fact of life that pervades every aspect of his existence. All around him, irons fizz and drives crackle through the air with that arrow-like trajectory that was once the preserve of Clarke and few others. Technology has levelled the playing field and the circus waits for no man, no matter how big his reputation, how impressive his bank balance or how deep the well of sympathy might be for his predicament. This is business and as Clarke makes a beeline for the practice chipping green, he doesn’t break stride for even one second when he spies a familiar figure with a notebook who might as well have the word “pest” tattooed in large letters on his forehead. This time, though, it’s different. He hasn’t shot 77 or missed the cut and when we catch up midway through the Pro-Am, Clarke explains just why his patience wears so thin when the tape-recorders pop out for the post-mortem comments after another less than satisfactory round of golf. “I’ve been a pretty soft target and it has been easy to write all the stuff you guys have been writing,” Clarke says, referring to yet another tale of doom and gloom chronicling his fall from grace. “Clarke has another bad day. He hasn’t played so well. You get the quotes from me: I’ve struggled. I haven’t played so well and that’s fine, because I have played poorly. But I want to get back to the bit where I am talking to you guys after shooting a 64 or 65 or 67 or having a chance of winning he tournament again. I don’t want to keep on giving you the reason to write about shooting another 74 or 75. I want to keep on going and trying to get back to playing well again. That is all I am working towards. Coaches have come and gone in Clarke’s career with monotonous regularity. One minute, Cowen is there. Turn around and it’s Butch Harmon. Blink and you’ve missed Ewen Murray. Another day it’s short game “guru” Stan Utley or maybe Clive Tucker. Journalists have never been high on his list of favourite people yet he fully understands the demands of the profession. When he was beaten by Sergio Garcia at the first extra hole in the opening round of February’s Accenture Match Play Championship in Tucson, joining Thomas Bjorn and Colin Montgomerie amongst those making an early exit, one paper remarked that he was simply continuing his downward spiral towards golfing “irrelevance”. Like Jack Nicklaus, who was written off before the 1986 Masters and used the press cutting as a motivational tool, one wondered if Clarke had noticed the piece or even cared. “It was actually ‘inexorable descent towards irrelevance’,” he says, immediately banishing any doubt. “I will repeat that to the said journalist whenever the situation arises. Whenever I have got a little bit of ammunition to fire at him. My reasons (for playing poorly) have been pretty well documented and different to everyone else’s. The said journalist hasn’t been through the same thing. Maybe it was a little too harsh, if you look at the facts. Yes, I haven’t played my best this year but that was well below the belt. “Whenever it is deserved, I have got no problem taking criticism. That’s fine. We are in a job, we are in the public arena and if it’s due then that’s fine. I have got no problems with that whatsoever. Clarke’s gigantic performances in last year’s Ryder Cup, just six weeks after his wife’s death, made him the darling of every Irish housewife until the Sunday papers reported that he was clubbing at Lillies Bordello in Dublin just hours after giving a heart-breaking interview on RTE’s long-running and highly popular Late Late Show, promoting “Heroes All: My 2006 Ryder Cup Story.” But Clarke can’t understand what all the fuss was about. “What am I supposed to do? Lock myself in my hotel room every night and stay in? I can’t do that. I’d drive myself more insane than Billy would say I am doing right now. “People have their opinion and I am in no position to change people’s opinion. That’s what they think and if they want to think that, let them think that. The only one who the choices I make make any difference to are the two boys. “Undue criticism is not nice but they are going to have their point of view. I can’t control what people are going to say or print. What would they do, if it happened to them? Maybe they are holier than I am and more right than I am? But until they are in that position, then they can’t tell me what they would do. Oh yeah, I wouldn’t go out and be seen. Yeah, right. Less than month later he was back on the gossip pages over his relationship with divorcee Nicky Regan but broke off the relationship in January “by mutual consent”. It’s all a far cry from the summer of 1997, when he was second to Justin Leonard in the Open at Troon. Or 2000, when he beat Tiger Woods in the final of the Accenture Match Play Championship. Or even 2001, when he was third behind David Duval in another Open at Lytham. Clarke’s public persona became even bigger after those performances. But the fat cigars, the fast cars and the feeling that a major was just around the corner was soon overtaken by a loved one’s battle with horrible illness and that feeling of helplessness, followed quickly by loss and grief. Such a traumatic experience can have a massive effect on a person’s personality and while Clarke admits that he is a far more philosophical character, he has no plans to change his spots completely and undergo a complete personality transformation. “Do I want to run away and hide?” Clarke asks. “No. You have got to face your battles front on and that is what I do and what I intend to keep on doing. Why should I start being boring and sensible just because I am struggling? No. That’s not me. “Until recently, the game has always come very easy to me. I’ve worked hard at it, don’t get wrong, but it has always been easy. Of late it has been difficult and I am not used to it being difficult, but that is the way things are. “I work really hard and I have always worked hard. It is just something I have always done. If you don’t put the work in, you can’t expect to get the results out. Vijay Singh and Padraig Harrington are two players that Clarke admires more than most. Singh is a regular practice partner and dinner companion. Harrington a peer and fellow Irishman. They are now his role models. “People who put the work in tend to get the results out,” Clarke explains, flicking a cigarette onto the 12th tee and letting rip. “Along with Vijay, Padraig has been one of the hardest workers in the world and he gets results out of it. He has obviously had a great year this year and got the results he deserved out of it. I am just trying to do the same thing, put the work in and hopefully get the results out. “If my career ended tomorrow, people would probably say, ‘He could have been better.’ And yeah, I could have won a lot more. I probably should have won a lot more than I have to date. But I don’t think I am done just yet. “When did Mark O’Meara win his first major? When he was 41? And Vijay? There are guys that won majors in their 40s. I am not 40 quite yet. I have another year to go and I just want to get my game back to a level where I can contend in tournaments and win tournaments. And then, when that is the case I can then think about the bigger ones. I still have no doubt that my good golf is good enough to win any tournament, whatever that may be. 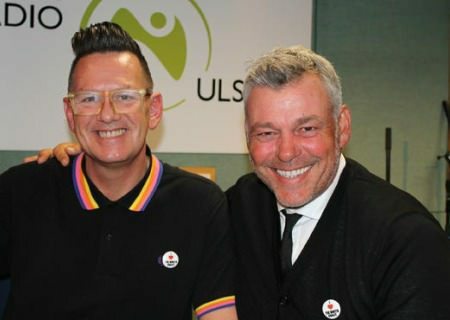 Being Darren Clarke can be fun too but apart from spending quality time with his sons Conor and Tyrone and enjoying the trappings of wealth that are the cars, cigars and fine wines, what Clarke most enjoys is a spot of fly fishing. A bit like this reporter, I suggest. Clarke smiles. When he’s not on the road, Clarke helps out with the homework and the 12 times tables. He does the bedtime stories and plays football with his kids, just like any other young dad. Harrington feels for his Ryder Cup team mate and believes that probably the toughest times for Clarke come late at night, when he’s on the road and there’s no-one at home he can call about the dark side of a golfer’s life. Go tell someone who cares, is often the chant when a professional golfer starts bemoaning his lack of luck - the drive that finished under the lip of a bunker or the putts that rimmed the hole and stayed out. Who can he call that really, truly cares? “Well, there is nobody. There is nobody. Billy is great but the personal stuff you can’t really explain it to anybody. Unless you have been through similar sort of things, it is difficult to explain. I have to keep it basically to myself. “Everybody needs a boost now and then. Everyone likes to hear nice stuff and I have a lot of people who do give me great support. Chubby, Newt, Lee (Westwood), McGinley, Bjorn, Padraig and Caroline. They went up to the grave on Heather’s anniversary and there is a lovely big bunch of flowers on the grave, which was really, really nice. And I do have a lot of support but I am at home alone all the time after my boys go to bed and that is just hard. But it is just the way things are. When he’s home alone, I wonder if Clarke is ever tempted to rifle through his small collection of tapes and DVDs looking for inspiration from past glories. What about the Ryder Cup at The K Club? Has he watched that one? “Yeah, a little bit. But not an awful lot. Maybe I should do. I don’t have that many. I find it much easier to remember the bad ones that the good ones. But that’s just me. So what’s the main difference between the Darren Clarke who spanked Tiger 4 and 3 at La Costa in 2000 and the man who can’t string four rounds together these days? Clarke is a now a very different man from the 24-year-old who turned up at Royal Zoute in Belgium for the Alfred Dunhill Open and won his maiden title by two shots from Nick Faldo and Vijay Singh in 1993. Seve and Bernhard Langer were tied for fourth with Gordon Brand Jnr and Rodger Davis. And while Clarke agrees that all has changed utterly in the intervening years, he has few regrets. “Golf is totally different to what it was, it’s true. “Saying that, it is a very competitive game. But if you look at the majority of sports, tennis is a different game to what it used to be, football is now a completely different game to what it used to be, and rugby now. Look at the guys who play rugby now! That it is a completely different sport. When I was growing up I went to Lansdowne Road every chance I could to watch Ireland playing rugby. Yes, the majority of the guys were fit, but not compared to the guys nowadays. “Sport has changed generally, sport has moved on. The rewards are greater and the guys are more professional now than they have ever been in lots of different codes. That’s just the way it is. “It would be nice, just once maybe, to play a tournament where you have got to use persimmon, blade irons and the old ball. I’d like to have a go, just once, just to see. As a fun tournament. That would be interesting. “I haven’t hit a persimmon club for a long, long time. I still have quite a few of them at home. The ball is hugely different now but the new technology has been fantastic for amateurs because there is much greater room for error. “When I was growing up and you hit a persimmon and slightly mis-hit it, it woudl go nowhere. Now you can get away with an awful lot. Coach Cowen hoves into view at this stage and begins a lament for the days when few could drive the ball as well as Darren Clarke. His caddie Billy Foster agrees. “You used to be able to kill a course with drivers but you can’t do that anymore because there are 50 guys in the field that can do that and there only used to be half a dozen,” Cowen says. If he keeps on working, Clarke might just achieve his goal. It certainly won’t be for lack of trying. Or talent. Darren Clarke is jaded from his whistlestop book signing tour on either side of the Irish Sea. Paul McGinley has been closer to Darren Clarke than almost anyone over the past decade and probably the man best qualified to assess his friend's chances of emerging from the golfing equivalent of the Mariana Trench - the world's deepest hole in the ground. Darren Clarke has been waiting more than two years for his 13th European Tour victory and he can lift the curse in Bahrain on Sunday if he displays the kind of patience that marked his third round 67 in the Volvo Golf Champions.